Princeton University Press, 9780691161198, 216pp. The social practice of tact was an invention of the nineteenth century, a period when Britain was witnessing unprecedented urbanization, industrialization, and population growth. In an era when more and more people lived more closely than ever before with people they knew less and less about, tact was a new mode of feeling one's way with others in complex modern conditions. In this book, David Russell traces how the essay genre came to exemplify this sensuous new ethic and aesthetic. 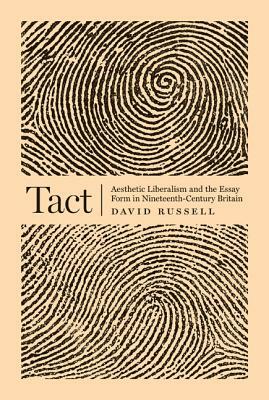 Russell argues that the essay form provided the resources for the performance of tact in this period and analyzes its techniques in the writings of Charles Lamb, John Stuart Mill, Matthew Arnold, George Eliot, and Walter Pater. He shows how their essays offer grounds for a claim about the relationship among art, education, and human freedom--an "aesthetic liberalism"--not encompassed by traditional political philosophy or in literary criticism. For these writers, tact is not about codes of politeness but about making an art of ordinary encounters with people and objects and evoking the fullest potential in each new encounter. Russell demonstrates how their essays serve as a model for a critical handling of the world that is open to surprises, and from which egalitarian demands for new relationships are made.